Saline, MI - ThyssenKrupp Materials NA, a non-ferrous coil distributor and processor has installed a Braner/Loopco Double-Loop Triple Turret Head™ Coil Slitting and Slit Coil Packaging System in its new Saline, MI, facility. The new Slitting Line is capable of processing stainless, aluminum, copper, & brass coils in gauges from .010" through .250" at slitting speeds to 1,000 FPM. Coil sizes can range up to 40,000# x 60" wide up to 74" OD with master coil and slit coil IDs of 16" and 20". 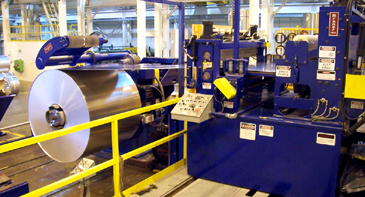 Hi-Production Triple Turret Head™ Stainless & Aluminum Coil Slitting Line. Entry Coil Handling: ThyssenKrupp receives many of its thin-gauge non-ferrous master coils eye axis vertical on pallets. A Coil Car-Tipper is employed to upend palletized coils to the eye horizontal position for processing. The Coil Car-Tipper efficiently "tips" the coil 90-degrees and loads the coil onto an Entry Storage Horn where 4-coils can be staged ahead of the Slitting Line. Coil Car-Tipper upends palletized coils and loads onto a 4-Arm Entry Storage Horn. Paper-Interleaved Master Coils: Surface-critical stainless and aluminum coils often contain paper interleaved between coil wraps. 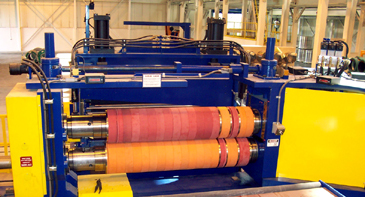 The ThyssenKrupp Slitting Line is equipped with a Paper Winder that neatly rewinds interleaved paper from the master coil as it is being processed. Interleaved Paper Winder efficiently handles interleaved paper. Single/Double-Loop Entry Section: The Slitting Line employs Braner/Loopco's hi-pass line arrangement that places the strip processing equipment above the coil OD to eliminate cross-breaks from forced reverse bending the strip. Hi-pass line saves floor space, provides excellent strip tracking, and allows the DC motor driven Uncoiler to operate in single and double-loop modes with no entry looping pit. DC Loop Control Uncoiler operates in single and double-loop operating modes. The Slitter Entry Unit is equipped with power adjusted Side Guides, Automatic Edge Guide, OVC Laminator, and an Entry Crop Shear. Pushbutton Tooling Lock-Up Triple Turret Head Slitter™: The 200 HP Turret Head™ Slitter is equipped with three 9" quick-change heads. Tooling lock nuts are eliminated in favor of a quick and efficient pushbutton operated hydraulic tooling lock-up system. The Slitter arbors are supported in precision machine tool bearings mounted in massive one-piece stress-relieved and precision ground solid steel housings that weigh nearly one-ton each. 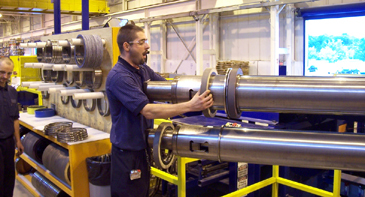 The rotatable Turret housing is supported on a 300,000# capacity anti-friction bearing for rigidity. The outboard arbor bearing housing is mounted on anti-friction machine tool slides and is opened and closed by pushbutton. Aluminum-bronze slides guide the vertically adjustable upper arbor bearing boxes and allow "zero" axial arbor movement. Massive upper arbor bearing boxes are adjusted by motorized zero-backlash screw jacks equipped with electronic encoder digital position readouts for quick, precise positioning. Pushbutton Tooling Lock-up Turret Head™ Slitter exchanges Slitter heads in about one-minute.